The Dude abides; the signature phrase that defined The Big Lebowski and Jeff Bridges’ performance as a guy named ‘The Dude’ whose only job is to take it easy. If the far out and trippy sequences in The Big Lebowski are your thing, the Sleeping Tapes won’t disappoint. Not only do the profits go to No Kid Hungry: Share Our Strength which aims to eliminate childhood hunger in America, you’ll hear Bridges share his thoughts on life as he puts you to sleep with an arresting mixture of tones like your own personal therapist. So what are the tapes? Well, to me, they are an opportunity to sit back and relax as only the well-admired Zen master of Hollywood does. Since his classic performance in the Big Lebowski, he’s been called The Dude as often as his real name. Bridges has said that he relates to The Dude more than any of his other roles over his long and successful career in film and the Sleeping Tapes show us why. Bridges takes us on a hike along Temescal Canyon in the California hills, near running waters along an ocean coast, and into the cavernous depths of his mind. The Raven sways in the wind at the very top of the pine. A lone black pennant. An incense signaling to those who watch that a storm is imminent. The wheat field boils the saplings fold and snap. We close the barn doors and soothe the stalled horses with whispers and hands. A crack of thunder sends a shudder through them. Passes into us. We stand together. Grounded. All legs trembling. Bridges gives us a strange but interesting gift on the tape ‘Feeling Good.’ He lays on compliments which most people have never heard before, but their quirkiness makes them seem that much more authentic. Have some fun with them (they might be true about you… and The Dude certainly thinks so). The Sleep Tapes are our glimpse into the peaceful and meditative nature that Bridges champions. No phrase better sums up the essence of his attitude than ‘The Dude Abides.’ In the tape ‘Temescal Canyon,’ we take a night time hike with Bridges up dirt paths, through brush brimming with the hum of nighttime bugs, by soothing streams, and Bridges stops to appreciate all of it. Crafting an articulate visual picture for the listener and mixing in nature sounds and ethereal tones, The Dude immerses us in his world. But the real beauty is that as he creates the experience around you, he does the thinking for you by showing us how he reacts. The effect is seeing “The Dude abides” in action, applied to all the large and small facets of the world. In life, we may never have the luxury of sitting in the California Hills with a joint in hand, appreciating a passing bird. 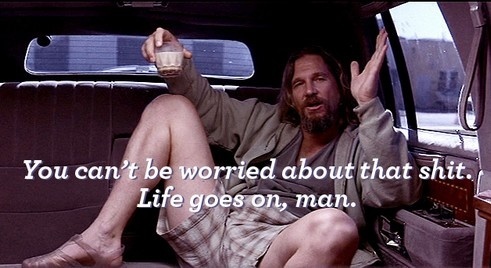 But we can invoke the spirit of The Dude as we tumble through life’s throes. Somehow, Bridges is able to see the world through rose colored glasses but maintain uncompromised clarity. Rather than seeing a traffic jam of events and feelings, Bridges sees a vivid picture of what life really is, and ought to be, with all of its smooth and jagged contours. I think it’s quite peaceful to know that all around the world people are listening to his tapes, sleeping that much more soundly, thinking of a long haired man in a bathrobe holding a White Russian. Thanks for reading the second part in my series called Life. If you didn’t catch the first article, be sure to check it out! Till next time, don’t let things get you down, just abide. The tapes are located here.